High school mathematics can be an incredibly intimidating subject for parents teaching their own children.Traditional math textbooks are not meant for independent study and most students struggle unless they have guidance. But unless you have the training and experience, it can be difficult to fill in that role of “math teacher”. And many of the most popular courses for homeschoolers lack depth and complexity. A lot of students get bored quickly and they lack the preparation they need for success in college. David Chandler has created Math Without Borders – a series of Home Study Companion video lessons to accompany the most rigorous and thorough math textbooks available, while maintaining a student-friendly approach. He is an experienced teacher of mathematics, but has also taught physics, astronomy, and computer programming. And after working with homeschool families at a charter school, Mr. Chandler wanted to develop the materials and resources families need to teach high school math at home. 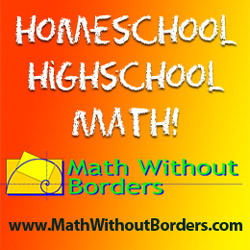 The Math Without Borders series is currently offering Algebra 1, Geometry, and Algebra 2/Trigonometry. Each one is meant to be accompanied by a separate textbook that can be purchased online and is often available in used condition for discounted prices. The Home Study Companion: Algebra 1 lessons accompany Paul A Foerster’s textbook “Algebra 1: ExPssions, Equations, and Applications”. Mr. Foerster brings his engineering background into the textbook, with frequent use of application problems on a wide range of real-world topics. Students are required to draw upon different skills and combine previous knowledge to solve them. David Chandler utilizes these opportunities for real learning to occur through his video lessons. Instead of simply completing the sample problems, he teaches students the principles and concepts behind the work being completed. These detailed explanations, in addition to the multitude of samples that he works through, illustrate the new information learned while emphasize the connections between concepts. In the Home Study Companion: Geometry video lessons, David Chandler has selected “Geometry: A Guided Inquiry” as the main textbook. Rather than the traditional, lifeless geometry textbooks, this book is actually interesting and is not a logic text disguised as a math book. Students are introduced to a “Central Problem” at the beginning of each chapter. As students proceed through the text, they learn how to solve the Central Problem and the underlying connections between the concepts presented. The authors remove the scary vocabulary found in most textbooks and use real-world applications that make geometry applicable to everyday life. This incredible text is illustrated and clarified further through Mr. Chandler’s videos and demos on the Geometer’s Sketchpad. He uses this dynamic geometry software as another opportunity for deep learning, allowing students to manipulate and work with figures in a way they have never experienced. And the Projects section at the end of the chapter should not be exclusive content for only the fastest students. It contains some of the most interesting material, both in the text and in Mr. Chandler’s lessons. The lessons found in the Home Companion: Algebra 2 with Trigonometry videos are for use in conjunction with “Algebra and Trigonometry: Functions and Applications”, also authored by Paul A. Foerster. Much like his text for Algebra 1, Mr. Foerster uses a readable narrative to reach students that is unlike most traditional texts students have encountered. But the video lessons David Chandler has created do more than review the new information from the text; he is teaching students to think about practical problems through a mathematical perspective. All of the topics and concepts learned in Algebra 1 are expanded upon and explored in depth through the video lessons. Algebra 2 is more than a second dose of algebra – students can expect to cover higher degree polynomials, exponential and logarithmic functions, data analysis, and will even be introduced to trigonometry. Mr. Chandler has developed a new product for the homeschool community: His lessons for Precalculus are available and will be ready for sale in June, 2013, as are the DVD-ROM of video lessons.Students will continue to use the 3rd edition of “Precalculus with Trigonometry”, available from Kendall Hunt publishing. Mr. Chandler also has a Yahoo Group with a wide range of information available, FAQs, and discussions. Parents can join in discussions and students will find a ton of math fun. Every one of the Home Study Companions has been developed specifically for independent study. David Chandler carefully selected the most thorough, highest-quality mathematics textbooks available on which to base his video series. He goes way beyond simply demonstrating the material and reproducing the samples from the text. Students will understand the underlying concepts and how they are connected – providing the fundamental building blocks they will need to be successful in college. Math is not just presented; it is taught. These videos are especially useful to those students seeking to be challenged in math and those considering math-related majors in college. But with Mr. Chandler’s incredible series, all students who complete a course will be prepared to master the next step in their academic journey.